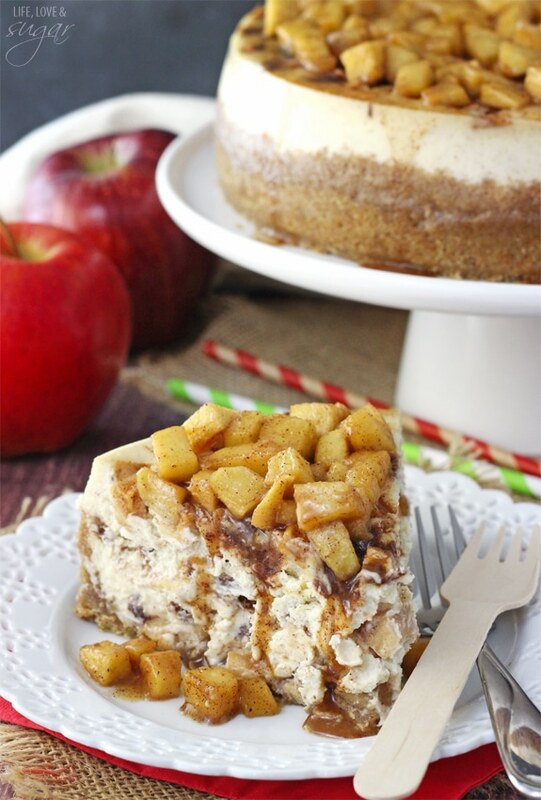 This Apple Cinnamon Cheesecake has pieces of apple and pockets of cinnamon filling layered into it to make the most wonderful apple-filled cheesecake! 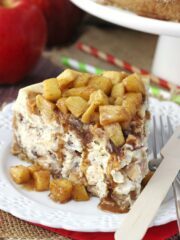 The combination of smooth, creamy cheesecake, cinnamon, and lightly crunchy apples is something you won’t want to miss! This post is sponsored by KitchenAid, but all opinions are my own. I don’t know about you, but I am really starting to get excited for fall. Apple baking always seems to get me in the mood. I start breaking out the cinnamon, nutmeg and caramel and just can’t wait to devour it all over some delicious apples! Enter this cheesecake. While I left out the caramel, I absolutely considered drizzling some over the top of it and you should consider it too. But even without it, the cinnamon and apples are pure fall heaven. Making the cheesecake takes some time, but really is easy to put together. That’s one of the great things about cheesecakes. Once it’s baked, you’re pretty much done. No fuss, just put it in the fridge to cool and top it with something tasty – cinnamon apples in this case. To make the crust, I started with vanilla wafer cookies. 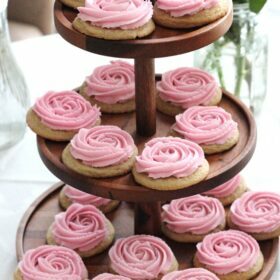 I love the extra sweetness from using them, but graham crackers would absolutely work too if you have them on hand. I added some brown sugar and cinnamon to the crust to the extend the fall flavors into the crust and I loved it! The cheesecake filling is fairly straightforward, it just has a little cinnamon in it. The real fun comes from layering the filling with the cinnamon filling and apples. OMG! To start the layering, you’ll top the crust with some chopped apples and drops of the cinnamon filling, then add about half of the cheesecake filling. 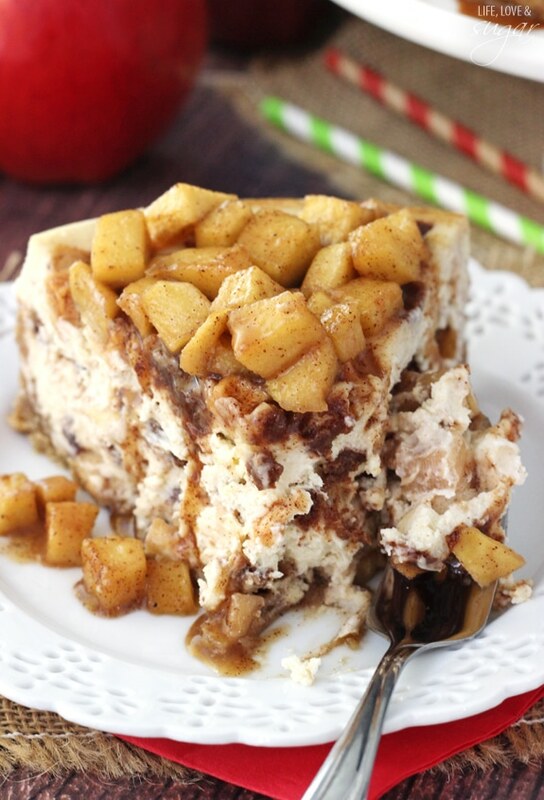 Layer in more cinnamon and apples, then the rest of the cheesecake filling. Top it off with the remaining apples and cinnamon, then try not to eat it all before it even goes into the oven. The smell is wonderful! 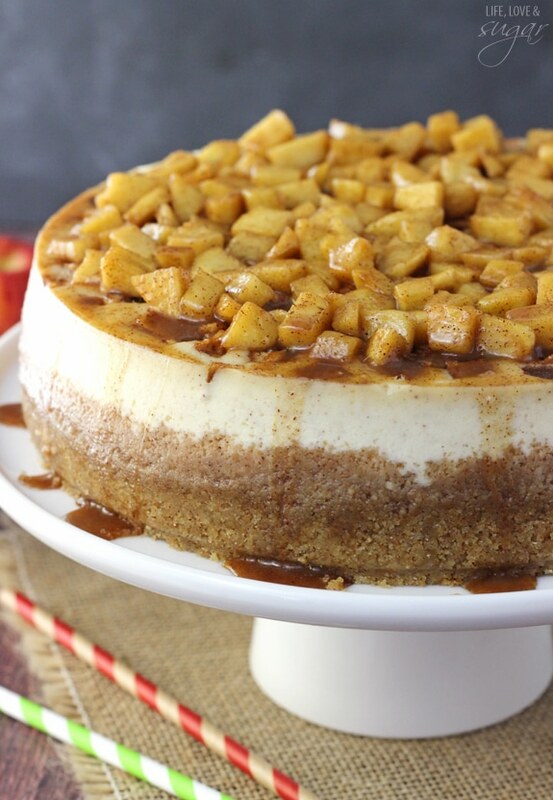 Once baked and cooled, the cheesecake is topped with more cooked apples. The process for making the apples on top of the cheesecake is pretty similar to the ones inside, except you add a little butter and cook them for about 10 minutes. 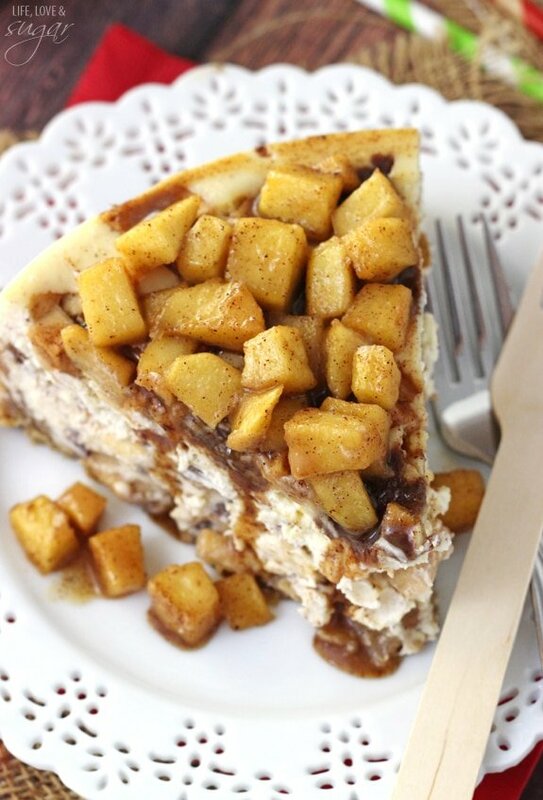 You could skip this step, but the additional apples really finish off the cheesecake nicely. You’ll want to chop the apples, add them to the pan with the brown sugar, lemon juice, cinnamon, nutmeg and butter, then cook them until they reach the right consistency. I say about 10 minutes, but you could cook them for more or less time depending on how soft you want them. And to spice up your fall even more KitchenAid and The Food Network have teamed up to host the Apple Challenge! That’s right – Food Network Kitchens will select the top 4 recipe submissions and the 4 finalists will win a trip for 2 to NYC for a live cook-off to cook their dish to be judged by Food Network chef Geoffrey Zakarian. One winner will receive the grand prize of a suite of KitchenAid Black Stainless Steel Appliances and a private cooking lesson with Geoffrey Zakarian. Um, I just died. How fun! And did you know that KitchenAid just came out with black stainless steel appliances? 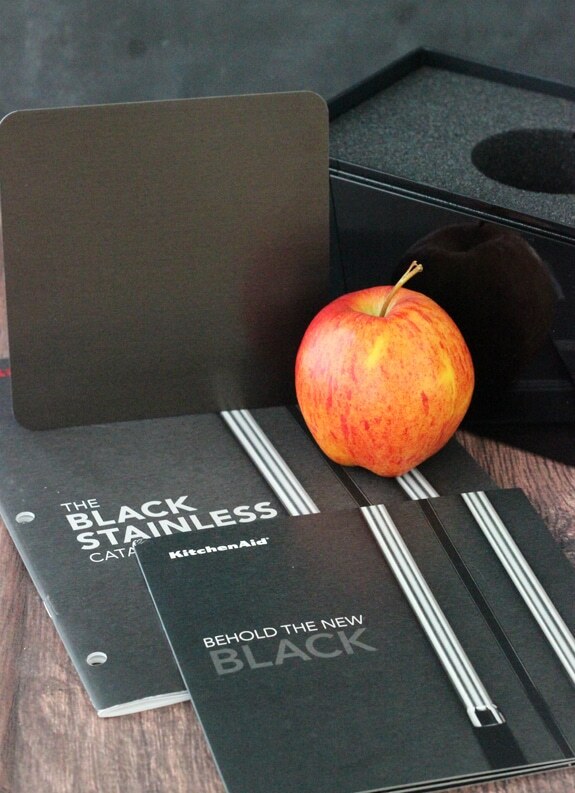 They sent me some information about them and a sample of what the black stainless steel is like, and I’m in love. We have black appliances in our kitchen and I’ve always wanted stainless steel, but like the black color. These are the perfect solution! Clearly I need to win that contest and update my kitchen. The contest ends September 14, so you better get on it! Submissions can be uploaded through Twitter or Instagram (with the hashtag #KitchenAidContest), FoodNetwork.com/applechallenge or food.com/applechallenge. And if you win, let me know so I can be super jealous. 1. Heat oven to 325°F (163°C). 5. In another medium sized bowl, toss together apples, brown sugar, cinnamon and nutmeg until apples are coated. Set aside. 6. In another medium bowl, whisk together brown sugar, cinnamon and flour. Stir in melted butter until combined. 7. Add about 1/3 of the apples to the bottom of the crust. 8. Break apart cinnamon mixture and sprinkle pieces over the apples, about 1/3 of the cinnamon mixture. 9. Spread about 1/2 of the cheesecake filling over the cinnamon mixture. 10. Add another 1/3 of the apples and cinnamon mixture to the top of the cheesecake filling. 11. 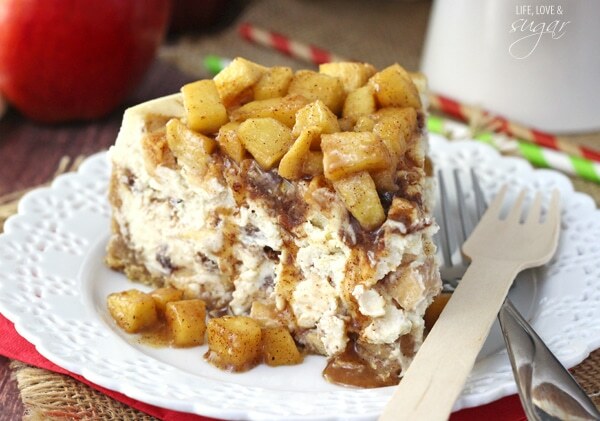 Spread remaining cheesecake filling over cinnamon and apples. 11. 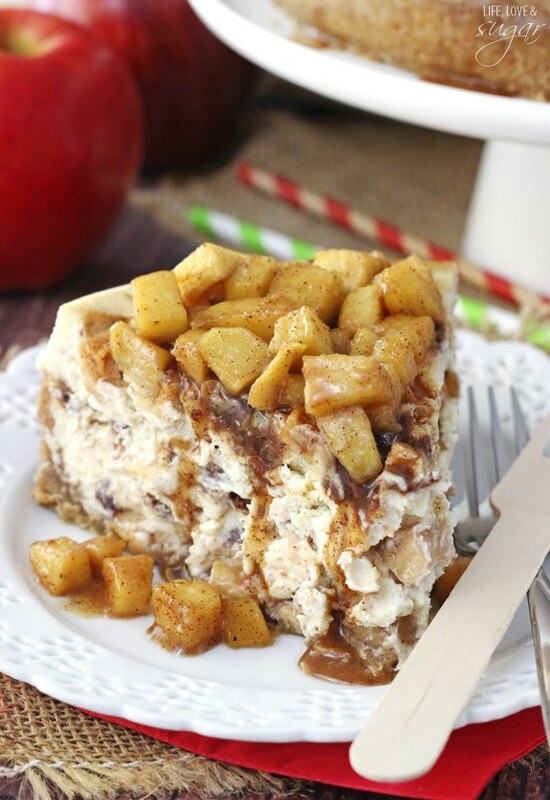 Sprinkle remaining apples and cinnamon mixture over top of cheesecake. 11. Place springform pan (covered with aluminum foil) inside another pan. Fill outside pan with enough warm water to go about halfway up the sides of the springform pan. The water should not go above the top edge of the aluminum foil on the springform pan. 8. Bake for 1 hour and 30 minutes. 9. Turn off heat and leave cheesecake in oven with door closed for 30 minutes. 10. Crack oven door and leave the cheesecake in the oven for about 20 minutes. 11. Remove cheesecake from oven and chill until completely cool and firm. 12. To make the apple garnish for the top of the cheesecake, add chopped apples, brown sugar, cinnamon, nutmeg, lemon juice and butter to a pan. Stir together until apples are well coated. 13. 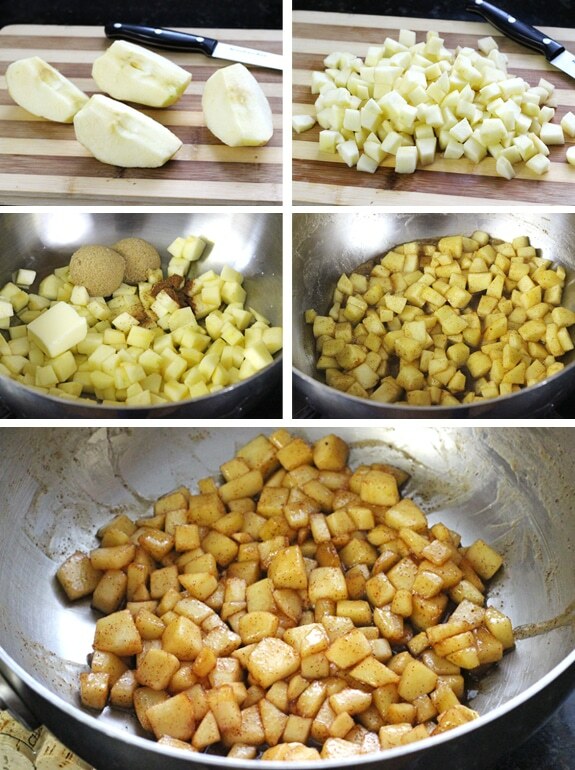 Cook apples on medium heat until at desired tenderness, about 10 minutes. 14. Remove cheesecake from springform pan and place on serving plate. 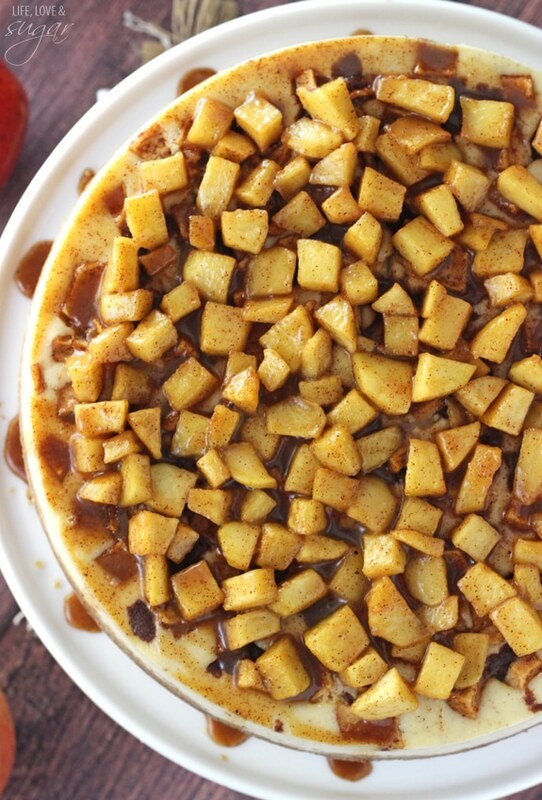 Add apples to the top of the cheesecake and drizzle remaining sauce from pan over cheesecake. Um, are you allowed to enter the contest? Because this cheesecake is for the WIN. It looks like the best possible way to use apples! 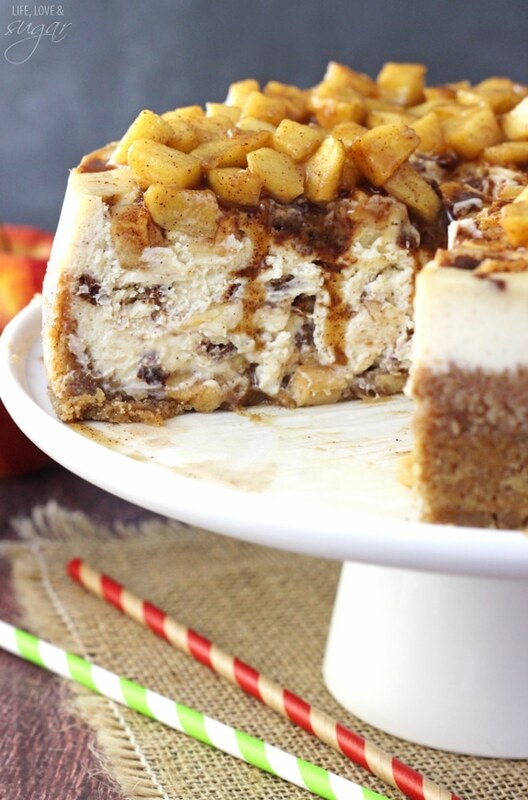 I’ll be dreaming about apples for days because of this cheesecake!!!! Seriously? Is this cheesecake even real?! Looks absolutely incredible!!! Ok… it’s in the oven! Let’s see!! Sooo, did u peel ur apples? And what variety of apple do u prefer to bake with? Thanks!!! I did peel them. And I usually use red delicious since they are my fave, but feel free to use whichever you prefer. I ended up using a couple varieties of apples… VERY VERY tasty!!!! Wonderful recipe! Thanks so much! And I LOVE your website!! My favorite above all others!!! Hi! Wonderful and flavorful recipe! I was wondering when you take it out of the oven is it still jiggly? I’m hoping it will firm up in the fridge. It’s for Christmas dessert so we are anticipating a good outcome. Thanks so much! Yes, cheesecake usually is jiggly in the center until it’s been refrigerated and cooled. I hope you enjoyed it! I truly love your website.. Great colors & theme. Did you build this website yourself? Please reply back as I’m attempting to create my own personal site and would love to find out where you got this from or just what the theme is called. Cheers! Hi Patricia! I’m glad you like the look of the site. I had a designer put it together for me. It was Lindsay from Purr Design. Mmm I love Cinnamon and Cheescake, Gotta try this out. Do you have to cover with aluminum? And what kind of pan do you put it in? Here’s a quick tutorial on how I do a water bath. I do use aluminum foil and usually put it in a larger cake pan, but I know people also use roasting pans and similar. This cheesecake was excellent, made it exactly as the recipe says. I will definitely make this one again, my husband wants it for his birthday. How far ahead can you make this? Could I bake it on a Thursday night and keep in the fridge until Monday? Should I keep the apple topping off until ready the day of serving? I’ve never ever made a cheesecake (only phony non bake kids…. ), and would love to make this for Thanksgiving. Any tips would be great!! You could keep it that long, but it would not be quite as fresh. I would recommend 2-3 days ahead at most. And Yes, I would wait to add the apple topping until the day of. Can this cheesecake go into the freezer? Made it and now company not coming for a month. I have not put cooked apples on top yet. Thought maybe freeze it then when it’s thawed then could add the hot apples before serving. Do you think that would be ok? Hate to ruin It! It’s that or eat it all myself! I haven’t ever frozen a whole cheesecake, but it should be fine. I wouldn’t freeze it for longer than a month though. Just wrap it well and thaw it in the fridge. This looks and sounds amazing! My hubby has asked for chocolate also, so I’m thinking of either adding it to the cheesecake filling as chips, or melting it into the mixture – which (if either) do you think would work best? It depends on how much of a chocolate flavor you want to add. Chocolate chips will be a little more subtle if added as chips. If you want to mix chocolate into the batter, melting chips would require quite a bit in order to actually taste it. You’d be best to add in some powdered cocoa. This recipe looks great and cannot wait to make it! The water bath part has me a little anxious. Is that a step I can skip or will it do harm if I do? Thanks again! I always recommend the water bath. It’s a few extra steps, but it’s worth it. Without it, you’ll often have a cheesecake that cracks, falls in the middle and browns a good bit around the edges. Here’s a tutorial for how I set mine up that might be helpful. Wonderful cheesecake! 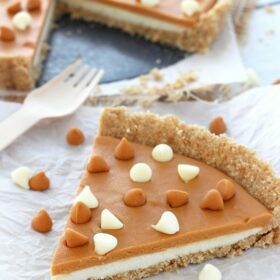 I’ve been asked to make a gluten free version of this cheesecake so I’m planning on doing this without the crust but can I use cornstarch instead of the flour in the cheesecake filling? You could, but you’d probably only want to use a tablespoon on cornstarch. I’m glad you’ve enjoyed it! Since I’m low carb, I tweaked this recipe to make it low carb by omitting the graham cracker crust and just used sliced apples as the crust, and about 1 tbsp of honey in the cream cheese mixture. Everything else was the same (no sugar). It was absolutely delicious! I’m so glad it worked for you and you enjoyed it! It is in the oven. It smells wonderful! I made this cheesecake for Christmas and it was absolutely perfect! It was a huge hit and possibly the best cheesecake I’ve ever had.